Line from the Film: "I want to see the terror of death in his eyes"
Released in its native Italy as Sinbad against the Seven Saracens, 1964’s Ali Baba and the Seven Saracens is a Sword and Sandal flick that, to be honest, isn’t much of an action film. But thanks to the outstanding work of its production crew, the movie still managed to impress the hell out of me. Ali Baba (Bruno Piergentili) is leading a revolt against the tyrannical Omar (Gordon Mitchell), who is intent on becoming the ruler of the entire kingdom. One night, while he and his followers are meeting in secret, Ali Baba is attacked by Omar's men. During the fracas, Ali Baba manages to escape into the desert, where he is eventually rescued by the beautiful Fatima (Bella Cortez), a Princess who just so happens to be a key member of Omar’s court! Ali Baba and Fatima quickly fall in love, only to be captured by Omar’s troops and locked away in the dungeon. But, much to his chagrin, Omar is prevented from executing Ali Baba by the law of the Magi, which states that the two bitter foes must face off against one another, as well as the best warriors of six other clans, in an upcoming life-or-death tournament, the winner of which will be declared king of the realm. 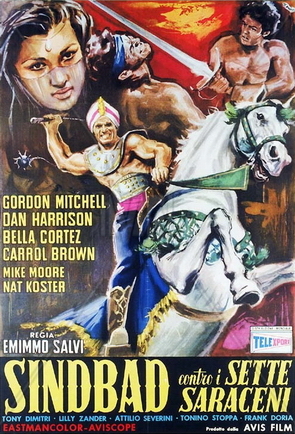 As Omar and his henchman Sharif (Tony DiMitri) conspire to rig the competition in their favor, Ali Baba gains the support of fellow prisoners Meneth (Luigi Tosi) and the diminutive Jukki (Franco Doria), who stage a mass breakout that, if all goes well, will end Omar’s reign of terror before it has a chance to begin. As mentioned above, Ali Baba and the Seven Saracens isn’t as exciting as it should be; the big tournament to determine who will be the next king doesn’t get underway until just before the 1-hour mark, and its first two competitions are as routine as they come. Only the third and final challenge shows any imagination at all (though even this was clearly inspired by the classic chariot race in 1959’s Ben-Hur). Where Ali Baba and the Seven Saracens distinguishes itself is in its production design (handled by Giuseppe Ranieri, who also took care of the Art Direction) and costumes (provided by Giovanna Natili), both of which convinced me I was watching a movie set long ago in the Middle East (especially good is a late scene in an underground corridor, which Jukki navigates in an attempt to open a hidden gate in the city's wall).